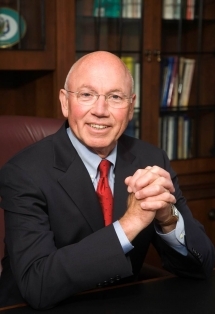 INDIANAPOLIS—Gene Tempel, founding dean of the Indiana University Lilly Family School of Philanthropy, has been named the “Influencer of the Year” in the U.S. nonprofit sector by The NonProfit Times, a leading nonprofit sector publication. Tempel was selected for the honor from among 50 leaders nationwide who The NonProfit Times is recognizing as its 2013 “Power and Influence Top 50,” the 50 individuals the publication considers to have the greatest impact on the nonprofit sector. The “Influencer of the Year” award was announced last night at a gala in Washington, DC, honoring the people who comprise the 2013 Top 50 list. The annual list recognizes leaders for their innovation, their influence on the broader sector, and for developing organizational models that can be replicated. It is compiled by The NonProfit Times’ staff and leaders from the philanthropic sector. Tempel has been honored on the list 12 of the 16 times it has been published since its debut in 1998. Tempel played an integral role in establishing the school and its precursor, the Center on Philanthropy at Indiana University, and served as the Center’s executive director from 1997 through 2008, developing it into a leading national resource. The Indiana University Lilly Family School of Philanthropy is dedicated to improving philanthropy to improve the world by training and empowering students and professionals to be innovators and leaders who create positive and lasting change. The School offers a comprehensive approach to philanthropy—voluntary action for the public good—through its academic, research and international programs and through The Fund Raising School, Lake Institute on Faith & Giving and the Women’s Philanthropy Institute.